Let´s just say that this is better than TYR, so, that settles another presumed Icelandic fight. 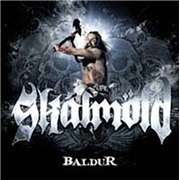 I quite like the “BATHORY-light” that SKÁLMÖLD produces, and the husky voice of the real life Baldurs of the band, one of them is really called Baldur, suits the music like a glove. I´d even go as far as to say that they perform some sort of Icelandic, fur-clad THE DOORS variety in “För”. The melodies, the various vocal parts, and the thick atmosphere are a must in these matters. The occasional more straightforward track, like “Hefnd”, is a welcome change, preventing them from being overly theatrical. But the major feature lies in the fabulous “Kvathning”. The use of an…oboe I believe, the archetypal harsh Viking feel and the atmosphere of a sedated interlude with calmer pace, all goes to prove there is still life in the genre. I bet SKÁLMÖLD agrees since my favorite song receives an edit treatment, of equal greatness, at the end. Long live the Icelandic force!